Once you have signed into your MailChimp account through BrightDoor Central, you will need to setup rules to determine which contacts from BrightDoor Central will sync to MailChimp. First, select the “New Rule +” button under the Contact Rules section. When setting up a new rule, you will need to update the rule name. In the example below, the rule name is “All Prospects”. Typically, the name should be indicative of the list members. Next, select the “Add Rules” button which will display additional search functions for you to begin to setup your list. MailChimp only allows BrightDoor to send one list to their system, so you should leave your rules are broad as possible. 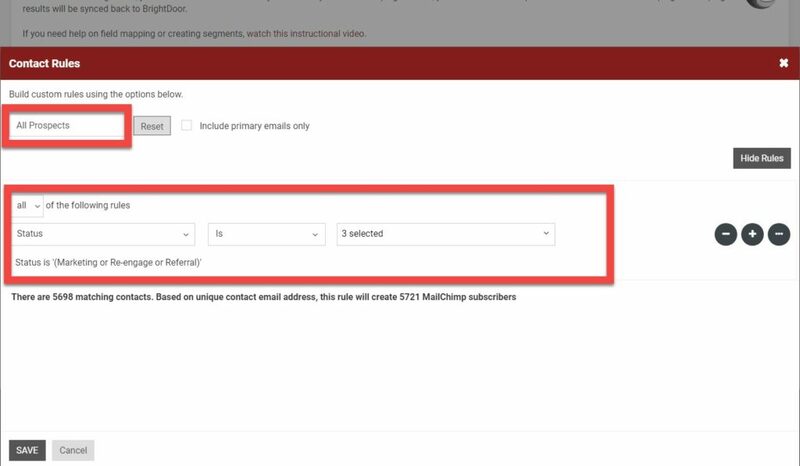 You will be able to filter your list into more targeted segments in MailChimp. 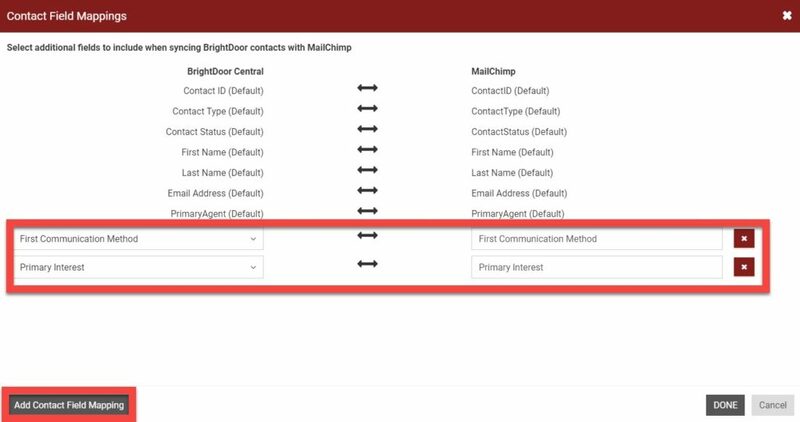 Once your contact rules are configured, you will need to choose what information for each contact is transferred from BrightDoor Central to MailChimp. In the Settings section, open the Manage menu and select “Map Fields”. By default, we will automatically sync Contact ID, Contact Type, Contact Status, First Name, Last Name, Email Address and Primary Agent to MailChimp. To add additional fields, select the “Add Contact Field Mapping” button. You have the ability to sync up to 16 fields. First, select the field from BrightDoor, then in the adjacent text field, type the label for the field that will be created in MailChimp. Select “Done” when you are finished. Now that you have configured who and what will sync to MailChimp, select the “Sync Enable” button to activate the integration between BrightDoor Central and MailChimp. Lastly, open the Manage menu in the Settings section and select “Sync Now”. This action will turn on the sync and submit all contacts established in your contact rules over to MailChimp within the next few hours. Going forward, any updates to existing contacts or newly created contacts will sync to MailChimp every 6 hours.